From time immemorial, when a rainbow appears in the clouds—almost always following a downpour—emotions of wonder and even religious sentiments have sprung into the human heart. Not surprisingly, therefore, we find that Sacred Scripture also harbors passages related to this low-atmosphere phenomenon. The most well-known passage of the Bible that mentions the rainbow is Chapter 9 of the book of Genesis, a conclusion to the narration of the flood. Starting from verse 8, there is a covenant being stipulated between God, on one hand, and, on the other, Noah, his children, their descendants (which, in Biblical context, means all of humanity), and all the animals: “I will establish my covenant with you, that never again shall all creatures be destroyed by the waters of a flood; there shall not be another flood to devastate the earth” (Gen 9:11). In the verses following, from 12-16, we hear more about the “sign” of this covenant: the “bow in the clouds”, or, in other words, the rainbow. Scholars agree that Genesis 9 was written by the author (or school) known as “Priestly”, which we can date back to the Babylonian exile, in the 6th century B.C. They also think it probable that its description of the rainbow as a “sign of the covenant” probably goes back to traditions or popular beliefs on the subject. The commentators, however, are divided. Some establish a starting point at Genesis 9:13,14 and 16, where the sacred writer always refers to the “bow”, using the Hebrew noun qešet that usually means a weapon, and say that the context for this is the image of a warrior God. The metaphor of the Lord wielding his bow is found in some Old Testament passages, such as: Ps 7:13-14; Lam 2:4; 3:12; Hab 3:9. In this case the rainbow would be the divine “weapon” being laid aside never to be picked up again (thus the rainbow as a symbol of peace), to show that the divinely inflicted punishment is over. Others say that the background of this text is simply an explanation of the natural phenomenon of the rainbow that, from ancient times, recalled the belief in a divine intervention to end the flood, making no reference at all to violence (the phrase “in the clouds” would serve to point out the difference between the rainbow and the bow as a weapon for hunting or war). In any case, the sacred writer insists rather on its function as a “sign”. Interestingly enough, the sign seems to be above all for God himself: “When I bring clouds over the earth, and the bow appears in the clouds, I will remember my covenant between me and you and every living creature—every mortal being—so that the waters will never again become a flood to destroy every mortal being. When the bow appears in the clouds, I will see it and remember the everlasting covenant between God and every living creature—every mortal being that is on earth.” This is worth noting because in the other two passages that mention a “sign of the covenant” (Gen 17:11, regarding circumcision, and Ex 31:16-17, regarding the Sabbath) the sign is for the other people involved. The way Genesis 9 presents it is unique, in the sense that God, in a most evident and seemingly naïve anthropomorphism, needs a sign to remember his commitment. The point the Sacred Scripture wants to make is God’s action in favor of creation and mankind’s and the animals’ dependence on his providence. In other words, just as in the Genesis 1 creation account, to which Genesis 9 has literary and thematic links, emphasis is placed on the fact that the earth, as a place where life is possible, would be unthinkable outside the divine will; on the other hand, human beings and animals, fragile in their very structure—as natural disasters such as the flood make clear—are under the care of that same divine will. From this perspective the rainbow also has a reassuring function: God does not forget to take care of his creatures. This aspect can be taken to a deeper level if we recall that the Biblical narrator places mankind’s sin at the beginning of the flood account. Genesis 6:5 says: “The LORD saw how great the wickedness of human beings was on earth, and how every desire that their heart conceived was always nothing but evil.” The promise to take custody of life in Genesis 9, then, also covers the potential destructiveness of the evil committed by human beings. We should also remember that the two aspects—which our modern mentality has successfully separated, making a clear distinction between catastrophes people are responsible for and those caused by unforeseeable and uncontrollable natural phenomena—were easier to reconcile in the ancients’ mentality, that we find in the Old Testament, where evil committed by men and women often has effects on the natural order (although recently the environmentalists’ sensitivity to climate changes has brought this relationship back to our attention). So if it was particularly human sin that brought on God’s destructive intervention by a flood, affecting the animals as well, God’s covenant putting an end to it takes in all life forms, since the covenant intends to overcome the human heart’s inclination to evil, and its negative effects (see Gen 8:21). The symbolic structure of the account allows for the affirmation that an essentially positive view of the world, typical of the Old Testament, cannot be blurred by either natural disasters or wickedness on the part of humans; this is because creation always manifests God’s will to care for and favor life. Perhaps the rainbow is a sign of all this precisely because the atmospheric conditions that make it possible are present only on certain occasions, when the destructive force of the storm dies down allowing the sun’s rays to fall. This exceptional and surprising quality of the rainbow, and the attraction of its colors, explain why in other passages of the Old Testament it is often associated with “splendor” and used as an image of God’s “glory”. In the inaugural vision of the book of Ezekiel, the prophet perceives “a figure that looked like a human being” (Ez 1:26) and “something like polished metal, like the appearance of fire enclosed on all sides, from what looked like the waist up; and from what looked like the waist down, I saw something like the appearance of fire and brilliant light surrounding him. Just like the appearance of the rainbow in the clouds on a rainy day so was the appearance of brilliance that surrounded him. Such was the appearance of the likeness of the glory of the LORD” (Ez 1:27-28). 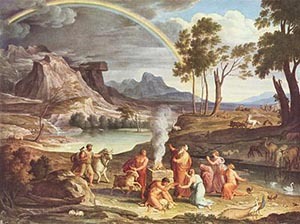 It’s difficult to say whether this representation of divinity means to recall Genesis 9: on one hand, the context and the function given to the rainbow are quite different between the two passages, leading us to believe that it does not; on the other, there are so few references to the rainbow in the Old Testament and such abundant testimony that Ezekiel and the “Priestly” texts in the Pentateuch are related, that that in itself makes us lean towards a “yes”. If we take up the latter hypothesis, it follows that Ezekiel is looking to recall implicitly, from its very first pages, God’s solemn commitment in favor of the world and the living beings in it. Thus the condemnations and threats that dominate the first part of the book would have to be read with this in mind: the Lord who intervenes to punish his unfaithful people (see chapters 4-24) and the foreign peoples (see chapters 25-32) seeks even in this apparent destruction their salvation and care. There are also two passages from the book of Sirach or Ecclesiasticus. The first of them looks to encourage praise for the creator and acknowledgment of the magnificence of his work, in a certain sense impenetrable to human wisdom. The rainbow is mentioned in verses 11 and 12, just after a reference to the heavenly elements (firmament, sun, moon and stars) and before the meteorological ones (wind, storm, snow, frost, sunset, ice, scorching heat, dew). 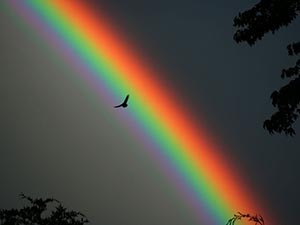 Perhaps this detail is not by chance: it could indicate a specific meaning given to the rainbow, which, like the stars, appears in the sky, yet is also connected to certain meteorological phenomena. In any case, the accent here is on praise and acknowledgment of the divine work: “Behold the rainbow! Then bless its Maker, for majestic indeed is its splendor; it spans the heavens with its glory, the hand of God has stretched it out in power.” We can compare this passage to the one in Ezekiel, not only because both mention “splendor” and “glory”, but also because they both refer to divine manifestation: the prophet in vision form, and the wisdom author through creation. On the other hand, Sirach’s view is complementary to that of Genesis 9: the rainbow there was a sign for God; here it is a sign for mankind. In Sirach 50:7 the rainbow appears again. This time it is describing not the “glory” of God, but that of the high priest Simon during the celebration of worship in the temple in Jerusalem: “How splendid he was as he looked out from the tent, as he came from behind the veil! Like a star shining among the clouds, like the full moon at the festal season; like sun shining upon the temple of the King, like a rainbow appearing in the cloudy sky” (Sir 50:5-7). The splendor of the liturgy, exalted in Sirach, reminds us that liturgical worship and priestly mediation are efficacious links between God and his people. In this sense, we could say there is an analogy with Sirach 43:11-12: just as the splendor of creation calls us to acknowledge the Creator’s greatness, the splendor of liturgical worship invites acknowledgement of what the Lord has done for Israel. In the New Testament, the passage of Ezekiel 1 is in the background in the opening vision of the second part of the book of Revelation (Rev 4:1-11). Here the visionary (John) is allowed to access the throne room of God in heaven (see verses 1-2) and he sees “one sitting” on the throne (unlike Ezekiel, the New Testament author offers no image or description of his figure); “around the throne was a rainbow [the New American Bible translates here and elsewhere halo] as brilliant as an emerald” (verse 3). As the vision progresses, a heavenly liturgy is described, taking elements from Isaiah 6: the general aim of the passage is clearly to give credibility to the message found in the book, indicating that John is a prophet to whom the divine plans are revealed. There is another reference (Rev 10:1) that describes a being that appears to be divine: “Then I saw another mighty angel come down from heaven wrapped in a cloud, with a rainbow [halo] around his head; his face was like the sun and his feet were like pillars of fire.” Almost the entire verse reminds us of a divine apparition: different passages of the Pentateuch describe the Lord who “comes down in a cloud” (cf. Ex 34:5; Num 11:25; 12:5; see also Deut 31:15 in its Greek Septuagint version) and the “column of fire” that led Israel through the desert (Ex 13:21-22; 14:24; Num 14:14; Neh 9:12-19). The angel holds a “small scroll” (Rev 10:2) which the visionary is asked to swallow (Rev 10:8-10) in order to continue to prophesy (v. 11). In this sense the context takes up some of chapter 4: the heavenly being’s apparition validates the next phase of John’s prophecy. It should be noted here that the ancient Greek Septuagint version (III-II centuries B.C.) translated the passages of the Old Testament regarding the rainbow using the Greek word toxón, or “bow”, in Hebrew qešet. The author of Revelation uses instead a different Greek term, îris, perhaps less prone to misinterpretation by his readers. This makes it more difficult to link these passages to Revelations and to Genesis 9, although some authors have tried to do so. In this case there would be a similar meaning to the one underlined about Ezekiel: some passages in Revelation are presented as announcing judgment, but in reality God is manifested as the primary seeker of salvation and life for his creatures. As we end our brief reflections, we could conclude that, in spite of the different possible interpretations, the meaning of the rainbow in the Bible is certainly positive: it takes us back to the manifestations of a God who fearlessly confronts the negative aspects of reality and of the human heart, to care for his creatures and fill them with life.